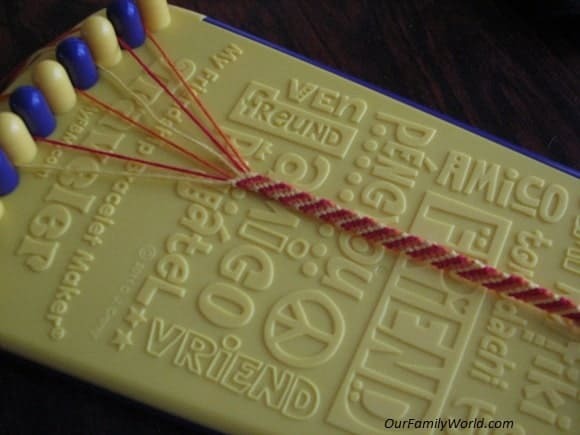 Making friendship bracelets brings back such memories for when I was a kid making these. I can’t remember how many I made but it was a LOT. That was my favorite thing to do when I learned how to make them. I don’t quite remember how old I was – I was either in middle school or high school at the time. All I remember is being in my room with my little basket of threads and the bracelet I was creating at the time. 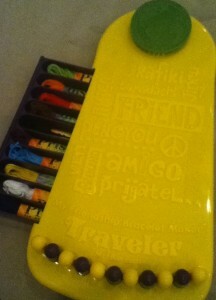 The My Friendship Bracelet Maker Traveler by the Choose Friendship Company would have been so helpful to me back then! I don’t even remember what I pinned my bracelet to, but I pinned it to something in order to keep it taut while making it. And I remember the many times I had to untangle my threads each time I had to come back to it when I put it away to do homework or eat dinner. It all started when David Crorey saw how his granddaughters made friendship bracelets the old-fashioned way and invented the My Friendship Bracelet Maker, My Friendship Bracelet Maker Traveler, and My Ribbon Barrette Maker. They have won many awards such as Dr. Toy Best Vacation Product and Creative Child Magazine Top Toy of the Year award. There are over 36 patterns on their website to choose from! Comes with pre-cut threads so you can start making a bracelet straight out of the box! It’s a great “toy” and helps to bring out creativity when it comes to choosing the colors and the pattern to make a bracelet with. My daughter doesn’t seem to have the attention span needed to actually complete a bracelet. She kept doing a row of knots and then stop to watch TV or play with her baby sister. She’s seven but still needs me to stay with her and watch her do each knot because she doesn’t quite have the knack of making the knots tightly and neatly yet. I’ve had to undo a lot of her knots because of it. I’m sure once she gets the hang of it, she’ll be able to do it all on her own. But until then, she chooses the colors and I’m the knot maker. It really is so handy and makes it so much easier to have a place to start, keep, and make bracelets. Compared to how I use to make bracelets, using the Traveler is definitely preferred. I’m sure all of you that used to make these as a kid can also attest to that! I was quite excited to see all the different patterns there are on their website. Some have video instruction and some are written. I only knew the Stripe and Arrow pattern as a kid. I think I’m going to have to borrow my daughter’s maker to make some myself. I really like the Be My Valentine pattern. I highly recommend this for kids that like to make things. It would make a great gift for the kids in your life! 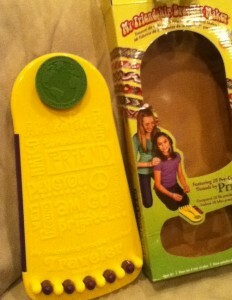 You can purchase the My Friendship Bracelet Maker at your local Michaels and Amazon.com. Frugal Wife Blog . I stay quite busy between running a household, blogging, and entering giveaways. I love the Daisy pattern! I couldn’t follow MYFBM because I’m maxed out at 2001. I like the Star and Stripes. Go 82nd. I like the heart pattern. Thanks for the chance to win! So far I’ve only made basic patterns, it would be great to be able to do more. I’d make the paw print pattern, perfect for football season! Thanks for the chance! I would love to learn how to make the shamrock pattern! But as of now, I only know how to do the stripe pattern. I only know how to make the stripe pattern but I would love to learn other patterns. We love ladybugs in this house. 🙂 Thank you! I love the feline kitty! I remember using a piece of cardboard to hold my thread for these when i was younger! It would be up to my grandaughter. I have never made them. If I won I would give it to my granddaughter. I’ve never made a friendship braclet, but my daughter loves to make them. She know a couple of different patterns, but I’m not sure of the names of them. I like the daisy and the feline kitty. I love to make flowery patterns. The Stars N Stripes would be cool for upcoming July 4th holiday and Military Awareness!